American International College (AIC) announces the opportunity for college students in Puerto Rico to continue their education at AIC at a greatly reduced cost. All of us – faculty, staff, and students alike – are aware of the devastation in Puerto Rico and want to provide assistance. American International College (AIC) announces the opportunity for college students in Puerto Rico to continue their education at AIC at a greatly reduced cost. Through the Puerto Rico Relief Scholarship, the College anticipates that this temporary program will allow students to continue their studies while Puerto Rico rebuilds its infrastructure following the impact of Hurricane Maria. Students who have been displaced from Puerto Rico are invited to apply to AIC to continue their education for the spring 2018 or fall 2018 semester. Students will be offered a flat tuition rate of $10,000 per year. Individuals in this program will be able to apply for additional federal financial aid which can assist in covering their remaining balance. 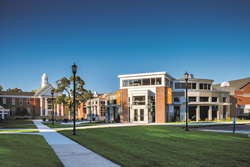 The College will guide prospective students through the application and financial aid process. “American International College was founded in 1885 to educate newcomers to the United States and prepare their children for citizenship and success. Today, AIC boasts an extremely diverse and vibrant student body with a vision of access and opportunity for all. We are proud to take an active role in the Springfield community, including close ties to our Puerto Rican neighbors. With these things in mind, all of us – faculty, staff, and students alike – are aware of the devastation in Puerto Rico and want to provide assistance,” says President Vince Maniaci. While some educational and residency restrictions may apply, students interested in learning more are invited to call the AIC admissions office at 413-205-3700 or email admissions(at)aic(dot)edu. Founded in 1885, American International College (AIC) is a private, co-educational, doctoral institution located in Springfield, Massachusetts. AIC is an international educational institution comprising the School of Business, Arts and Sciences, the School of Education, and the School of Health Sciences. AIC supports and advances education, diversity, and opportunity for its students and the community.